Is The First Domino About To Fall? Greece has been on the edge for a long time, but right now the first Eurozone domino is rocking and close to toppling. 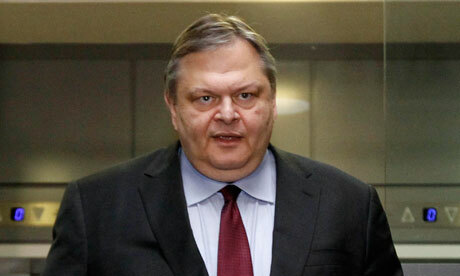 The Greek finance minister wonders who ate all the pensions. Greek youth unemployment rate has now reached 48% … Union leaders have called a two-day strike starting tomorrow … Despite negotiating until nearly dawn, the coalition government headed by Lucas Papademos could not agree the details of cuts to pensions.This leaves Greece short of around €300m of savings needed to persuade its international lenders to approve its second rescue deal. If the Greeks reject the ‘rescue’ plan – you have to put the word ‘rescue’ in inverted commas given the nature of the help on offer – then all hell will break loose. Personally, I think the deal will squeak through for now … but the times are hard and these pips are squeaking. 3 Responses to: Is The First Domino About To Fall? I think people forget what a small population Greece has,about 11.5m and only a working population of 4.5m. These figures make the debt look even larger and any opportunity of repaying it impossible. Despite all the messages coming from the ECB, Greece’s looks increasingly likely to tumble. You can only hold your breathe under water so long!